Boardgames in the News: Does “More Mainstream” = “Less Friendly”? Modern board gaming has always been a very inclusive and friendly hobby, if niche. For example, people attending conventions often carry games home for friends, but more surprisingly, they also often carry games for complete strangers. This can require trust from either or both parties: sometimes it is the “mule” who pays for the goods, sometimes items are preordered and paid for in advance and then collected by the “mule” and posted on. Similarly trusting are those that take part in the “Maths Trades“. These are multi-person trades which happen in a loop with everyone receiving a game from one person and giving a game to somebody different. Obviously if one person fails to honour their part of the deal, the whole thing breaks down. Yet these things happen on a huge scale with hundreds of people participating, and although there are occasionally problems, most people are very happy with the result and take part again and again. As the hobby grows, the first signs of change are perhaps becoming visible. For example, earlier this year voting for the Deutscher Spiele Prize was closed four days early due to attempted vote-rigging. It seems an online video blogger claimed he had a special deal with the publishers of one of the games in the running, KLONG! (aka Clank! : A Deck-Building Adventure), Schwerkraft Verlag. He posted a video syaing that if the game won the award, he and all the followers of his YouTube Channel would get a promo card for the game. Schwerkraft denied any involvement, but around a hundred votes were cancelled (about half of which only placed the one game) and other people were unable to vote at all because voting was stopped prematurely. The organisers of the Deutscher Spiele Prize say Azul‘s position at the top was never in doubt and KLONG! would not have won in any case. It might have improved on its eventual seventh place though, perhaps threatening the positions of Heaven & Ale and Pandemic Legacy: Season 2 (which finished in fifth and sixth respectively). Perhaps this could be seen merely as a gamer trying to game the system, but whatever, it leaves a nasty taste in the mouth. More serious was the series of thefts from stalls that occurred at Essen this year. 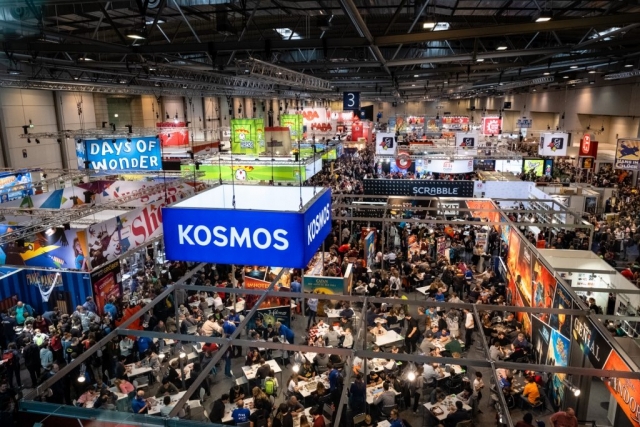 It was not the first time money had been taken from a stand—famously, at Essen in 2016, Ludicreations had a cash box stolen, containing about €3,500. R&R Games were also robbed that day, but the Ludicreations theft is known more widely thanks to their response. Such a loss can be very significant for a small company, so inspired by the theft, they designed a game called Steal this Game and launched it on KickStarter, raising over $50,000. This year the fair grew and so did the thefts. Six companies fell victim this time, Artipia Games, FoldedSpace, Greenbrier Games, Gotha Games, Hub Games and Japanime Games. Reportedly, the thieves got away with a total over €20,000, but not without loss themselves as staff on the Artipia stand (ironically demoing their new game A Thief’s Fortune) realised what was happening. Although they weren’t quick enough to stop the theft, they succeeded in detaining one of the decoys. There is no suggestion these crimes were carried out by boardgamers, in fact, the Police have said that they were a professional team. Two people distracted the cashier by bombarding them with questions and a third then swiped the cash-box. Efforts are now underway to recoup the losses which were mostly uninsured. Japanime Games are collecting donations, while Artipia Games have launched a KickStarter campaign for five promo cards. Attention has also turned to trying to prevent the same thing happening next year. There have been calls for more vendors to take card payments, however that is not without its problems. This was amply demonstrated at the UK Games Expo this year which coincided with a Europe-wide Visa systems failure leaving many gamers unable to pay for their purchases. There is also a question mark over whether the infrastructure available at the Messe would be able support everyone moving to card transactions at such a bug fair with such a large commercial component. For these reasons, Merz Verlag (the company who run Spiel) are focussing on increasing security and making it much more visible. Conversation is still on-going and it remains to be seen how much these changes will alter the feel of the show. One thing is clear, however, the wider world has discovered our little hobby and that brings some unpleasant consequences. This entry was posted in News and tagged A Thief's Fortune, Azul, Clank! : A Deck-Building Adventure, Heaven & Ale, M.U.L.E. The Board Game, Pandemic Legacy: Season 2, Steal this Game on November 14, 2018 by nannyGOAT.